My friend Jeanne who blogs over at Cook Sister! is hosting this month’s mingle and has dedicated the challenge to Barbara Harris who recently passed away after battling cancer. I did not know Barbara, but as we are a community there is a sense of loss. Jeanne asked us to share our cancer stories, and make something yellow. Cancer is a word we are all so familiar with. I am sure there are many people out there who have been touched in some way by this disease. It is as common a term in our medical language as influenza and chicken pox. Both my grandmothers and my maternal grandfather passed away from cancer. It was a word I became familiar with before I was a teenager. It also means that I am super vigilant and stay on top of my annual medical checks. One of my oldest friends is a breast cancer survivor. Camilla is an amazing person and is willing to discuss her experiences with anyone who is facing the same issues. She writes a great blog about her life. When I was in my twenties I wanted to become a blood donor. I have a very rare blood group and I know that it would be a good thing if I could donate my blood. Unfortunately my blood pressure is so low that I am not allowed to donate blood. This prompted me to become a bone marrow donor and the charity that I support is The Sunflower Fund. It is a registry of bone marrow donors from South Africa. This is an important organization to me on a personal level as Jews of Eastern European descent are extremely prone to Leukemia and maybe one day my B(Rh-) blood group will come to good use. Has cancer touched your life in any way? Now, on to something yellow, the theme for this month! I had two eggs yolks left over from my soufflés that I made, and I decided to use them for pasta. I wanted to make the pasta even more yellow by adding saffron to the egg yolks. Pasta to me is one of the easiest things to prepare. this is easy to make! Thanks for sharing your experience and enticing recipe. Hi Tandy – thanks so much for taking part in this very special Mingle. I have lost two very good friends to cancer – Christelle was only 29 and Peter was just 40. My dad was living with prostate cancer at the time of his death as well. Luckily I also know a couple of awesome and inspiring cancer survivors. It’s a hateful disease and I pray that a cure will be found in our lifetime. On a cheerier topic – I love this pasta! Saffron is such a fabulousy versatile spice, both in sweet and savoury dishes. I have quite a few friens that had cancer or passed away due to cancer. My MIL is a breast cancer survivor. Luckily my family on my side has been clean, up to now, with the exception of my one uncle. His cancer is in remission at the moment. It is such a terrible disease. I can only hope you all are not touched by this disease! A touching post Tandy – interesting to know more about you through this. Barbara will be missed. Yes, I also have had family members and friends die of cancer. Horrid disease. Good for you on the bone marrow donating. It’s something I’ve never considered. Your pasta looks great. Praying every day that we come up with a cure. your pasta is so bright yellow and delicious. Missed you as you are no longer in my wordpress reader. 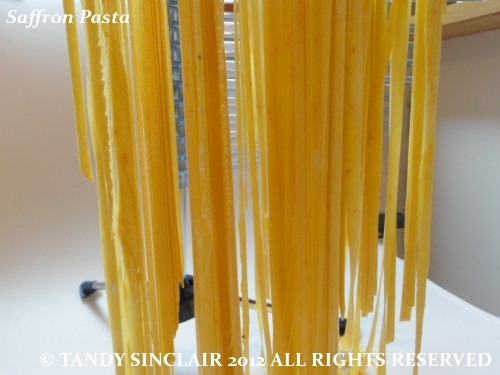 I love to make home-made pasta often. I never made saffron pasta before but I will from now on! 🙂 Yummmmmmmm! Lovely yellow pasta, Tandy. The markets in our are don’t carry saffron…to expensive for our small towns if guess. Sadly Tandy, I believe all families have been affected by cancer in one way or another – I too have had 2 grandparents pass from cancer, have an uncle who is fighting it at the moment and with a quick count both my hands are full with other family and friends who have succumbed to this dreadful dis.ease. Lovely idea to add saffron to your pasta. I must remember to do this next time I make pasta. I love saffron – wish it wasn’t so expensive.